Super Metroid is the third game in the Metroid series and the game which truly earned the franchise its reputation as one of Nintendo’s best. Though, story-wise, it is better to have knowledge of the first two games, there’s a recap of the events of previous entries at the start, so this could be a good place to begin, if you’ve not played a Metroid game before. 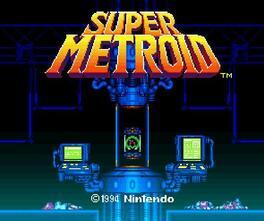 The story starts with Samus heading to a research station to hand over the last known Metroid in existence (a baby). Sadly, this quickly takes a bad turn when Ridley (the evil space dragon member of the Space Pirates) shows up and steals it. Samus chases after him in her ship and ends up, once again, on the planet Zebes where she needs to explore the huge cave system in order to find and eliminate all the key Space Pirates to stop them from exploiting the power of the Metroids. Exploring Zebes is a really satisfying experience as the game has a very nice art style and a beautiful soundtrack which perfectly sets the tone of each of the different areas. What’s great is that you’re not really given too much direction and you feel quite free to explore as you wish (and there’s an extremely handy map screen too, for the first time in the series). Also, I should be clear that Zebes is definitely not only made up of caves; sometimes you’re even on the planet’s surface (the game starts on the surface during a beautiful rainy day), sometimes you’re in an underground swamp, sometimes caverns which are completely submerged in water and even a haunted (space)ship wreck. As you progress through the labyrinthine cave system, you find various items which give you more powers and you then use these powers to access areas which you’d not have been able to get to before. This gives the game a linear sense of progression without ever making you feel stifled in your freedom. I suppose this is where the only real downside comes in, and that’s that, when I was playing I had a moment or two where I couldn’t figure out exactly what I was supposed to do, but it never lasted too long. So, this is a game I very strongly suggest you try (especially since it’s quite easy to get hold of via the Virtual Console) the difficulty is always at a comfortable level and the whole experience is hugely enjoyable. I have to say, even though the story doesn’t take a huge focus, there’s still a moment in the game which I found quite emotional, so it holds up in that department too. I wish it could have been a bit longer, but it wasn’t too short, just shorter than I’d have liked.